Professor Stefan Savage in front of CSE building. Just days after he accepted the prestigious ACM-Infosys Foundation Award, University of California San Diego professor Stefan Savage received another honor: the Irwin Mark and Joan Klein Jacobs Chair in Information and Computer Science. This endowed faculty chair at the UC San Diego Jacobs School of Engineering honors the school’s namesakes: Irwin and Joan Jacobs. 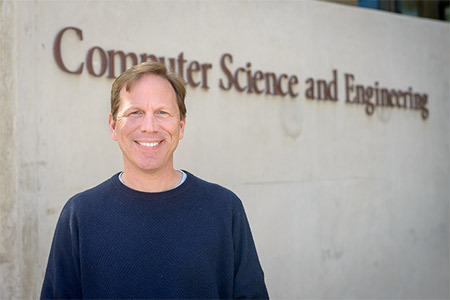 “From the moment he arrived at UC San Diego in 2001, Stefan Savage has been a star on the CSE faculty, with broad interests in systems and networking as well as security,” said Rajesh Gupta, Professor and Chair of the Department of Computer Science and Engineering (CSE) at the Jacobs School of Engineering. “Stefan Savage is an outstanding scholar, teacher and mentor. In addition, he has done the hard work necessary to ensure that his security research makes a real and lasting impact on society. And for that, we all benefit,” said Albert P. Pisano, Dean of the Jacobs School of Engineering. The appointment of Savage to the Jacobs Chair was the second faculty chair announcement in as many weeks. Previously, CSE computer graphics and vision professor Ravi Ramamoorthi was tapped to be the inaugural holder of the Ronald L. Graham Chair of Computer Science. The Graham Chair was named for professor Ron Graham, who recently retired but maintains an emeritus faculty position in the department. Graham is the previous holder of the Jacobs Chair that is now going to Stefan Savage. In addition to co-leading the highly successful Center for Networked Systems (CNS), Savage also leads the security and cryptography group at UC San Diego and is an active collaborator with Peter Cowhey in the School of Global Policy and Strategy (GPS) on security policy. With Cowhey, he also co-teaches a popular course on security policy.